Rutgers Cooperative Extension (RCE) continues to expand its efforts in urban Extension by securing funding to work directly with municipalities and their residents to address important issues afflicting New Jersey’s towns. Rutgers Cooperative Extension of Somerset County has partnered with Hillsborough Township and Stony Brook-Millstone Watershed Association (SBMWA) to obtain a $175,539 grant from the New Jersey Department of Environmental Protection (NJDEP) to address flooding problems that are associated with the Royce Brook. The Royce Brook flows through the center of Hillsborough into the Borough of Manville and ultimately the Raritan River. The project will focus on engaging the community to adopt practices that help reduce flooding and clean the water in Royce Brook. The grant will provide funding to install rain gardens in the Township among other stormwater management practices. Patricia Rector, environmental agent for RCE of Somerset County, will lead the project. This collaborative partnership will begin the process of reducing flooding in Hillsborough Township and improving the water quality of Royce Brook. Key partners include the Hillsborough Township Committee, Sustainable Hillsborough Steering Committee, the Environmental Commission, RCE Water Resources Program, RCE Master Gardeners, SBMWA staff, and Township residents. For more information, please contact Patricia Rector at rector@njaes.rutgers.edu. 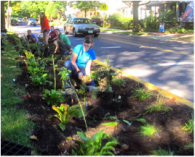 Photo of Volunteers planting a curb-cut rain garden from the RCE Water Resources.